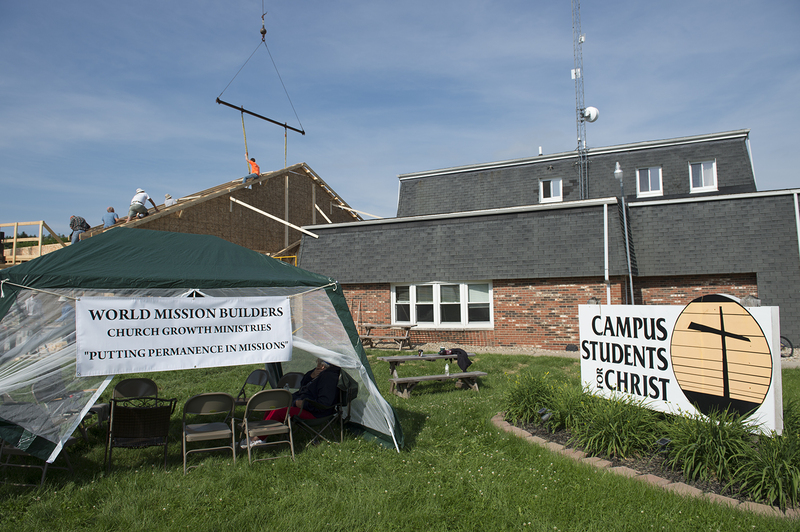 MACOMB, IL - -Campus Students for Christ (CSC), of Western Illinois University, is building its new ministry building located on Riverview Drive in Macomb. The new building is being funded by donors from all over the world. CSC has been proudly serving the WIU community since 1969, and the ministry has partnered with several other campus groups. Its biggest partnership is with the WIU International Studies Program, which helps promote various needs. In the past CSC has hosted the international students' Thanksgiving dinner and New Year's traditions. Barry Reed, director of Campus Ministries and also a WIU alum with an undergraduate degree in accountancy, said the best part about working with international students is learning from them. The ministry also does various service projects not only locally but also through different states and abroad. CSC assists with tutoring, youth programs and WIU staff camps. Prior to moving in the current ministry building, CSC met in a house on Johnston Street. The current ministry building was a former sorority house built in 1968. The sorority house, which holds 12 apartments, was taken back by the bank. CSC purchased the building in 1978, and began its worship service. The building was used for social events, office space, bible studies and more. However, its limited space became a conflict as the ministry began to expand. In 2004, the ministry began to consider adding more space. "When we would have bible studies, the residents and I had to move our cars to Horrabin Hall to have space. Our assembly room has low ceilings and is not ground level. It is not easy accessibility," Reed stated. "We had three full-time staff members and we have had an intern. He sat in the lobby. We also have only one public restroom, with one toilet. We need the extra space." Reed designed the building using Google Sketchup and took it to an architect at Round Table Designs in Mount Vernon, IL. The design was then sent to Jones Surveying and Engineering Corporation in Macomb. Royce Jones, president of Jones Corporation, is a WIU alumnus and was more than happy to help start the project. The funding for the building has been donated from different venues. Approximately 30-40 churches, who have supported CSC for many years, donated. 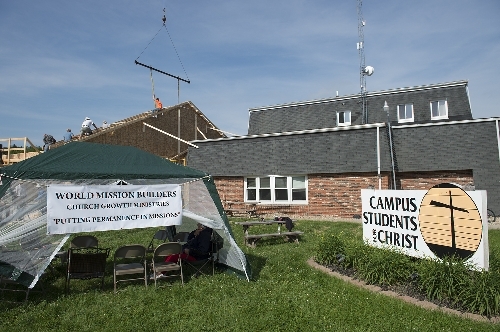 Aside from the churches, the funding also comes from WIU alumni, parents of alumnus and members of the community. "The donations started in the middle 2000's when the dream came about for the building," said Reed. Some of the donations are unexpected. CSC received a surprise donation from Bushnell Truck Repair and Towing Services. "Billy Lewellen let us use his crane. He looked at me and said 'all of this is through donations right?' I told him yes and he said 'well this crane is too,'" Reed stated. Monetary funding is not the only way people have donated; others have donated time as well. 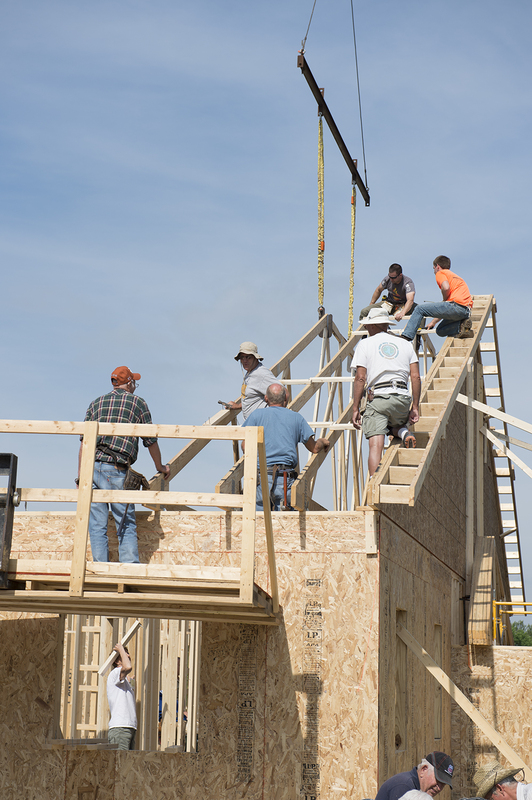 There are about 60-75 volunteers a day that help with building, cooking, cleaning and more. Some of the volunteers are from as far as Texas and Oklahoma. Reed guesses that by the time the summer is over more than 150 volunteers will have helped with this project. "In the end, it will be hard to add up what's been given to us because some things don't have a price," Reed stated. The new 6,000 square foot facility will be added on to the existing building. The facility will have an auditorium, four private offices, an administration office, gender restrooms, a kitchenette, two storage rooms, a foyer and a medium conference room that will later be divided into two offices. Reed expects that the new building will create new partnerships, fix the logistical issues the old building had and also allow for a bigger ministry. CSC wants to help more international students as they are accepted into WIU. They also hope to make the new building available to any other student groups that would like to partner with CSC. The facility will also be more accessible for individuals who need to be on ground level. The building is expected to take about a year to be completed. It will be open by the 2016-17 school year or earlier. While the building is primarily open to the ministry, it welcomes the WIU community to join them in more events and fellowship. "Even though we are not governed through WIU, we have been able to provide something that they can't, and I hope that after the facility is open we will be around for a long time." Reed stated. For more information, visit wiucsc.org/.